Guess who’s back? Yes we are and again we’ll be serving the best what black music has to offer! Last October City Queens re-emerged in the Ghent nightlife with a true ‘Soul School Reunion’, 15 years after the birth of the concept. It proved to be a great experience for many and the party shot right back in the spotlight. The Ghent Vice crew re-united and dug up those hip hop and r&b tunes that light everybody’s fire. The vibez felt so damn right, we just had to do it again. This trendsetting concept was an immediate success from the start and became thé standard for urban related parties in Flanders. For 10 years, black music enthusiasts travelled to Ghent about 6 times a year from all corners of the country to shake away to their favorite music in Vooruit or on a couple of exceptional occasions, in Culture Club. City Queens does not only devote itself to the pure hip hop culture but also has an ear for the better dance tracks within the genre. Especially for the ladies, this was and is a refreshing alternative to all that raw hip hop violence. And because the ladies matter a lot, they can get in for free before midnight! Those dj’s that are now the absolute masters in the genre as TLP, Killa Tactics, Davidov and Black Frank built their name and fame on City Queens. They were the ones spinning the records on the last edition. And they will be back for more on this one! The complete Ghent Vice crew on their home turf, all together on one stage, rippin’ it up, those who know them, know what this means! They will be digging up all their best classics and mash them up for seriously hot and dirty action on the dance-floor. Especially for this occasion, Studio Brussel presenter and the white personification of black music for over 25 years, TLP will be joining forces one more time with Dors, his long time colleague on the radio and behind the decks. They may have parted ways physically but never in spirit. 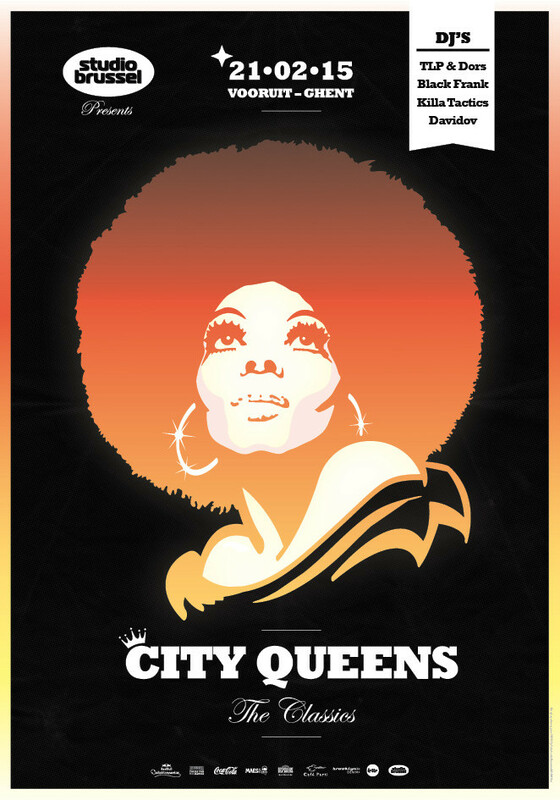 They will be bringing that spirit to life once again on this edition of City Queens: The Classics. The legendary Ghent Vice crew will be joined by the Killa Tactics collective from Leuven. They also don’t take to the stage collectively very often anymore and played an impressive reunion set on the last edition. So we are very happy to welcome them back to do it all over again! Join us on Saturday February 21st in Vooruit and get your booty on!